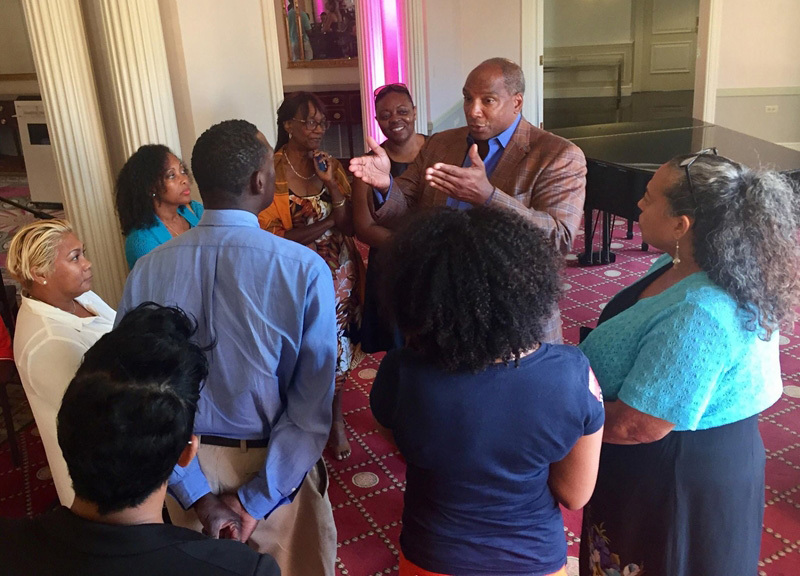 Local entrepreneurs picked up valuable insight about growing their businesses from leading international small business expert, Earl Butch Graves, Jr., CEO of Black Enterprise and board member of the Bermuda Tourism Authority. In a 30 minute talk, followed by 30 minutes of questions and answers, Mr Graves talked primarily about access to capital, the importance of accumulating generational wealth versus focusing on income and the benefits of small business partnerships which improve entrepreneurs’ economies of scale. Tourism industry stakeholders were invited to the event last week at Hamilton Princess Hotel & Beach Club. About 75 people attended. Bermudian entrepreneur Marico Thomas of Four Star Pizza and Glaze said of the session, “Salient. Sober. Stimulating. Butch spoke thoughts and concepts all entrepreneurs – budding and experienced – need to hear.” Mr Thomas is also vice-chairman of the Bermuda Economic Development Corporation. Bermuda Tourism Authority CEO Kevin Dallas asked Mr Graves to put on the forum while he was in Bermuda for a board meeting. “The audience was very engaged during Butch’s presentation, they asked insightful questions and when it was over it was tough to get him out of the room because so many wanted to bend his ear further,” Mr Dallas said. Before integration, Black businessess were thriving because we had no choice but to network with each other. Just like we helped each other to build our houses when de banks refused to give us loans!!!!!!!!!!!!!!!! So I can be successful just like everyone else? This is good news. The 1% can be successful while everyone else will struggle to reach the fleeting illusion. Being successful in reality comes with excess capital and being accepted by the right people. Many work all their lives for success but it’s only achieved by their next generations because trickle down is so little it takes so long to get to the non elites. ROSE WARREN: Great race Caitlyn Bobb we are very proud of you Happy Birthday. Awesome. mixitup: Great work Bermuda!! Lets get ten more! Know your place: Thank you MP Ming and the C#1 branch. It was an awesome event!